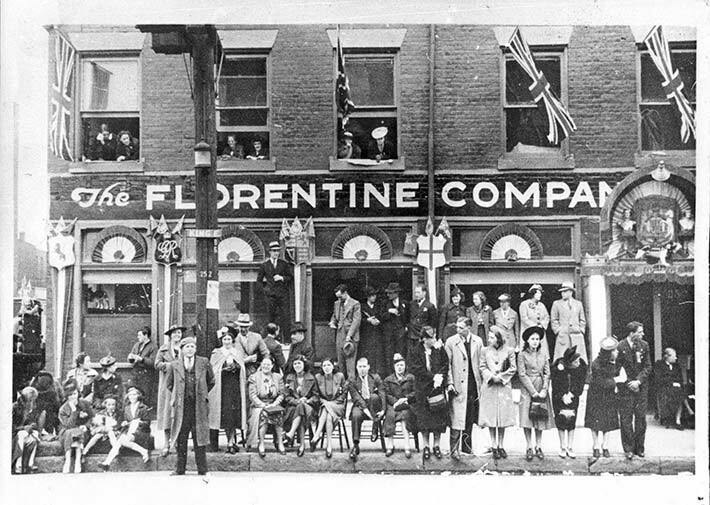 Black and white photograph of Florentine Lighting Company. The Toronto-based business established in 1909 was co-owned by internee Massimo Iacopo Magi. According to the Royal Canadian Mounted Police (RCMP) file, Maxime Jacopo Magi was arrested because of his affiliation with the Fascio Principe Umberto, where he was the Secretary, and for overseeing the Toronto dopolavoro (after work) group. He was arrested while at work at the Florentine Lighting Company, where he was co-owner. A number of his employees, including Ruggero Bacci and Antonio and Pietro Danesi were arrested at work. The photograph offers a streetside view of the storefont. More than 45 individuals (all unknown) are shown standing in front of the store and looking out of the windows above the shop. British flags are drapped in each of the five windows above the store. The people appear to be looking down the street, research indicates that the crowd is most likely awaiting a motorcade with the Queen of England, who visited Toronto in 1939.